MOREHEAD CITY — Construction has begun on a $200,000 shellfish mariculture demonstration center at Carteret Community College that will expand research and training opportunities. 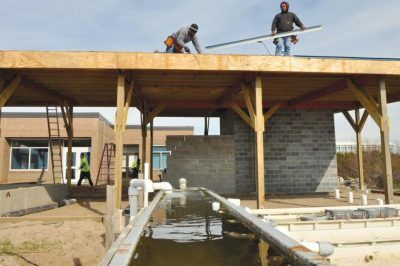 The approximate 2,500-square-foot structure is being built behind the Howard Aquaculture Building at CCC. Funding for the project comes from a $50,000 National Oceanic and Atmospheric Administration Sea Grant Aquaculture Extension and Technology Transfer grant, as well as a $150,000 appropriation from the North Carolina General Assembly. Funds provide for construction and equipping of the center. Cerino said he’s excited to see construction well underway and expects the facility to open this spring. LA Downey & Son of Morehead City is in charge of construction. The original completion date was October 2018, but Hurricane Florence caused the project to be moved back, according to Cerino. 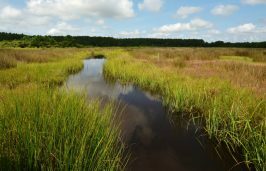 The N.C. Division of Marine Fisheries approved a 2.57-acre research demonstration lease last summer as part of the process to create the center for Carteret Community College and North Carolina State University students and researchers. Mariculture, a specialized branch of aquaculture, involves the cultivation of marine organisms for food and other products in the open ocean or sound, an enclosed section of the ocean or in tanks, ponds or waterways filled with seawater. The site will provide hands-on training and research activities to advance sustainable shellfish mariculture, according to Cerino. He said it will not only benefit students, but help develop businesses for those interested in the industry. The area starts just east of the Howard Aquaculture Building and extends to the west side of the N.C. State University Center for Marine Sciences and Technology building. Cerino and North Carolina Sea Grant marine aquaculture specialist Chuck Weirich worked with University of North Carolina Wilmington to secure a $300,000 grant in 2015 from NOAA, with $50,000 of the money earmarked for the Bogue Sound shellfish lease expansion project. The NOAA grant provides funds to establish shellfish mariculture demonstration centers at UNCW and the site shared by N.C. State University CMAST and CCC. The grant also funds work that involves comparison of oyster gear types and different native oyster strains at industry partner sites around the state and evaluation of sunray Venus clams as a means to diversify the industry. Cerino said the area would also be used to do research on other types of clams and bay scallops. The lease allows for non-commercial production of shellfish within the proposed area. To enhance the opportunities for the aquaculture curriculum courses currently offered at Carteret Community College. To provide a site for the development of the N.C. Shellfish Farming Academy, which will provide training for new and existing shellfish growers through the CCC Corporate and Community Education Division. To serve as a site to conduct experiments to develop best management practices for sustainable industry development. As for the new structure, it’s “basically a covered pavilion with two main areas. One will be for the filtered seawater systems and the other is a work area for shellfish nursery systems and for sorting and processing shellfish,” he said, adding there’s also a storage area for equipment. This story is provided courtesy of the Carteret County News-Times, a tri-weekly newspaper published in Morehead City. Coastal Review Online partners with the News-Times to provide our readers with news of the North Carolina coast.